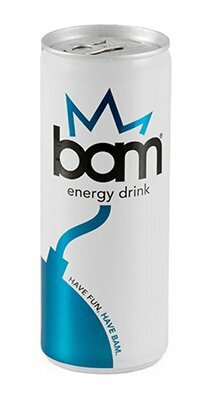 BAM Energy Drink - Have Fun, Have Bam. In our name we contain all the explosions generated by the energy fun. Our logo provides a conscious similarity to American pop art . A small cameo of Neo pop that, through the onomatopoeic sound, refers explicitly to a sparkling and vital force. Full of energy, a hallmark, for those who like to have fun with personality. Can you drink high amounts of Bam? The ingredients are permitted and safe, the contribution of caffeine to a 250 ml can is equal to about one coffee; each person should then adjust consumption as it does for coffee or tea. Caffeine is a naturally occurring substance in the leaves, seeds or fruits of more than 60 plants, including coffee, tea, cocoa, cola nuts and guarana and is known to have a stimulating effect on the central nervous system. The B vitamins are normally present in Bam have an important role in mental performance and energy metabolism..
Taurine is an amino acid found naturally in our body that contributes to the neurological development and helps regulate the level of water and mineral salts in the blood. The sugars play a crucial role in the diet and in human metabolism: provide energy to the body quickly usable. In what circumstances it is not recommended the assumption of Bam? Women who are pregnant and children, doctors recommend reducing consumption of caffeine and consequently the assumption of energy drink.